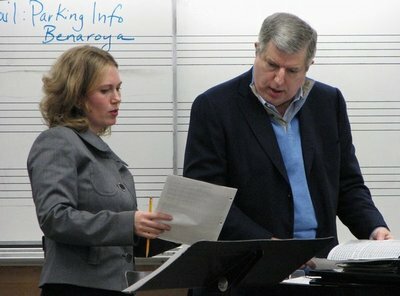 University Chorale Director Giselle Wyers consults with composer Marvin Hamlisch during a rehearsal in the Music Building this week. The UW Chorale will make its Seattle Symphony debut in March in an American musical theater extravaganza conducted by Seattle Symphony’s newly appointed Principal Pops Conductor, Marvin Hamlisch. 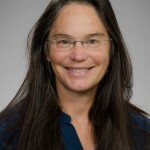 The Chorale, a 60-voice select choir under the direction of Giselle Wyers, will join the Seattle Symphony — with featured vocalists Anne Runolfsson and J. Mark McVey — and Hamlisch to celebrate the best of American composers Richard Rodgers and Irving Berlin in five Pops concerts. 2 p.m. Sunday, March 9. Hamlisch is notable for the great versatility of his music, as well as its substance. As a composer, Hamlisch has won virtually every major award that exists: three Oscars, four Grammys, four Emmys, a Tony and three Golden Globe awards; his groundbreaking show, A Chorus Line, received the Pulitzer Prize. He is the composer of more than 40 motion picture scores, including his Oscar-winning score and song for The Way We Were and his adaptation of Scott Joplin’s music for The Sting, for which he received a third Oscar. All concerts are in the S. Mark Taper Foundation Auditorium of Benaroya Hall. 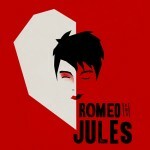 Tickets range from $17 to $77 and can be purchased in person at the Seattle Symphony Ticket Office, by calling 206-215-4747 or online at www.seattlesymphony.org. Student and senior rush discount tickets, subject to availability, go on sale in person at the Seattle Symphony Ticket Office at 6 p.m. prior to evening performances and two hours prior to afternoon performances.